July | 2013 | Hand Luggage. 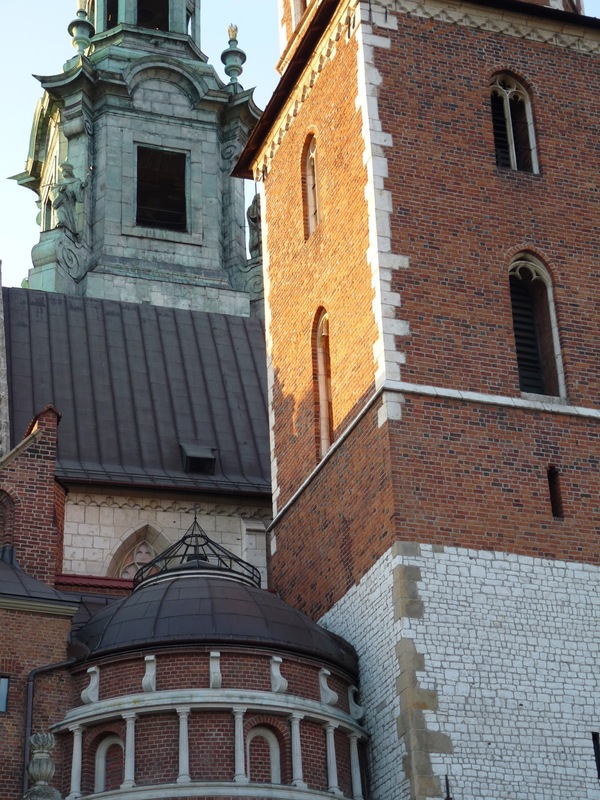 As promised / threatened in an earlier post, here are some photos of Wawel and its surroundings. 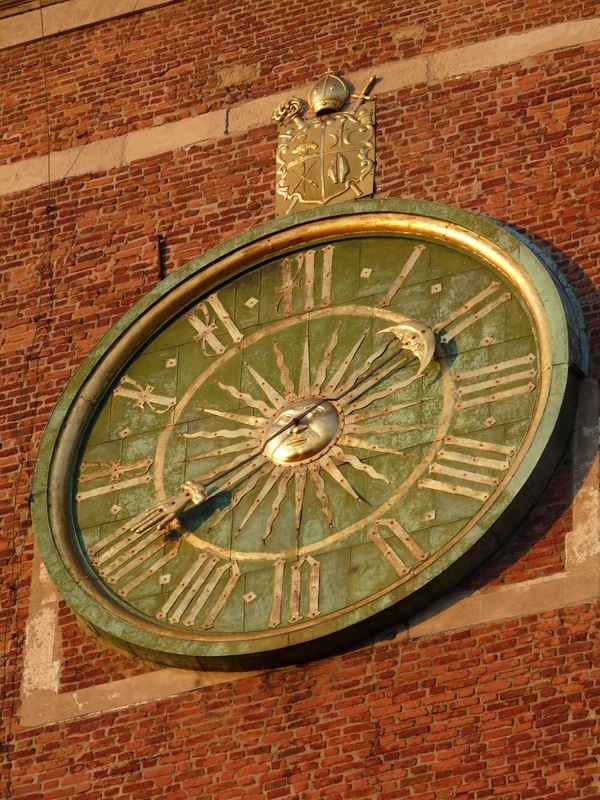 Wawel is a fortified complex situated on a limestone outcrop on the bank of the Vistula river in Krakow. 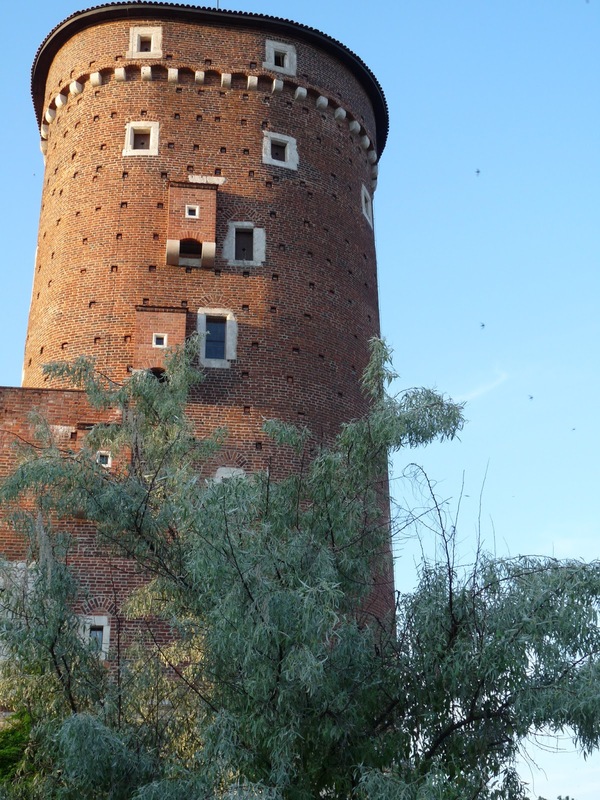 The complex has lots of beautiful buildings and fortifications within it. 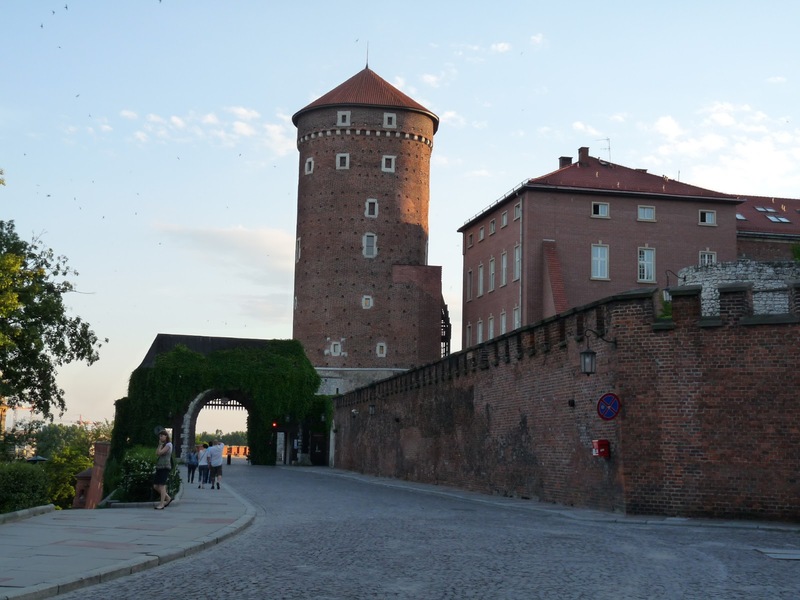 These include the Royal Castle and Wawel Cathedral. 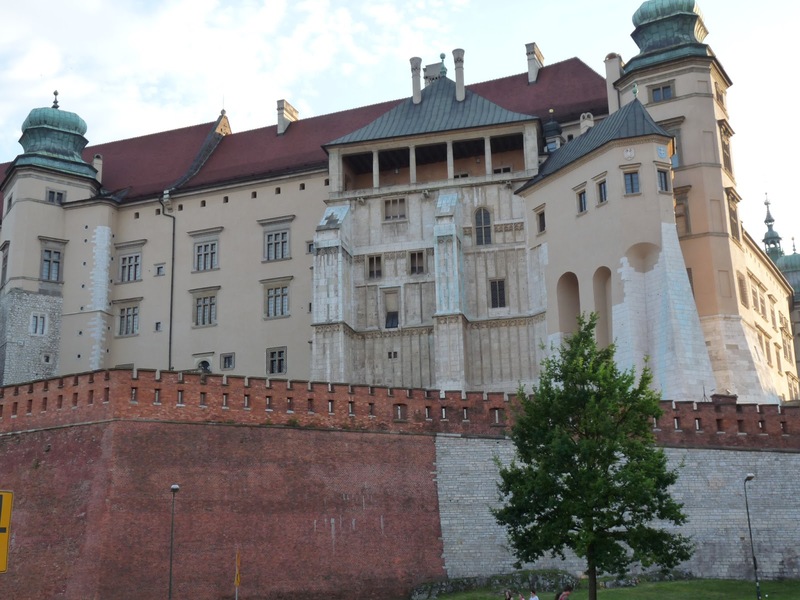 The impressive fortifications of Wawel as seen from the street below. 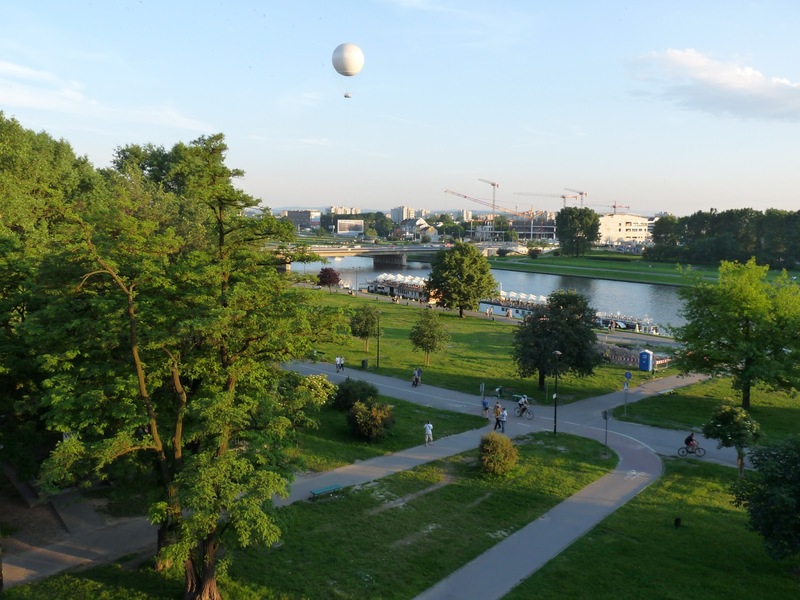 The parkland beneath Wawel with the Vistula river in the background. Here you will find the locals hanging out, picnicking and enjoying the sunshine. 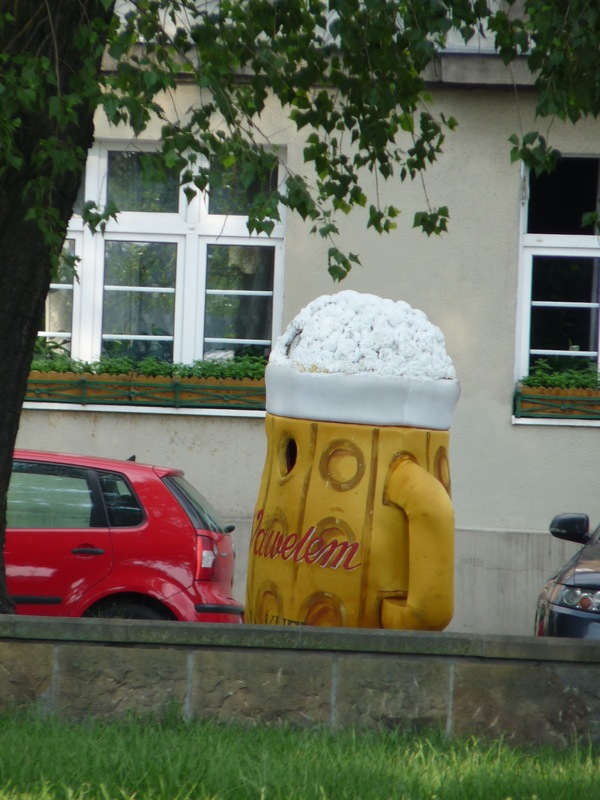 You can also find the fire belching Wawel dragon and if you are lucky, the walking beer man!!!!!!!!! 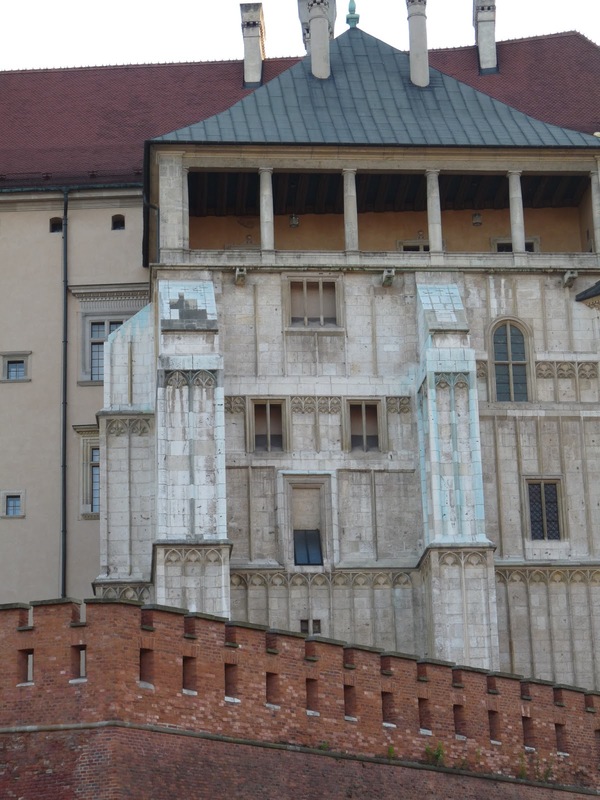 Above are some of the decorative and impressive architecture within the Wawel complex. 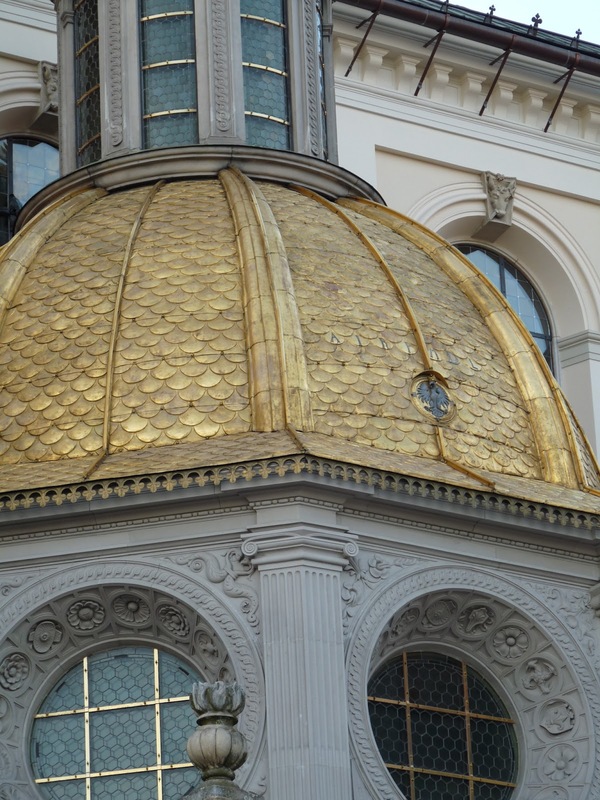 The small golden dome is the Sigismund Chapel. Neatening up old posts, laughing at myself, Johnny Depp and SEO . . . So, taking a brief break from narrating my latest exploits in Eastern Europe I have had a quick scan back through the past three years (!!) 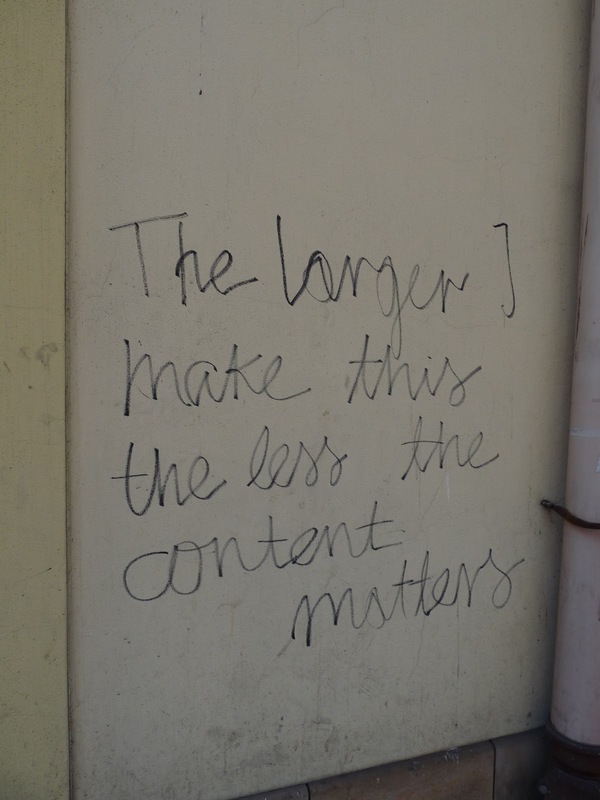 of blog posts. As I did so I’ve been tidying up posts. 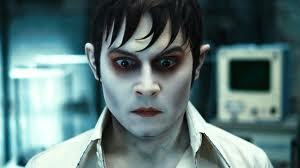 ARRRGHHHH Johnny why? Why? Why? Stop taunting me . . .
My blog has always been more of a stream of consciousness for me, and a place to put just a few of the myriad of travel photos that I take, rather than an active attempt to reach out and connect with a wider audience. But in recent weeks I have been trying to up my game, partly because in my line of work – PR – the future is online and digital and I really need to get to grips with SEO, PPC and a whole host of other bewildering acronyms. 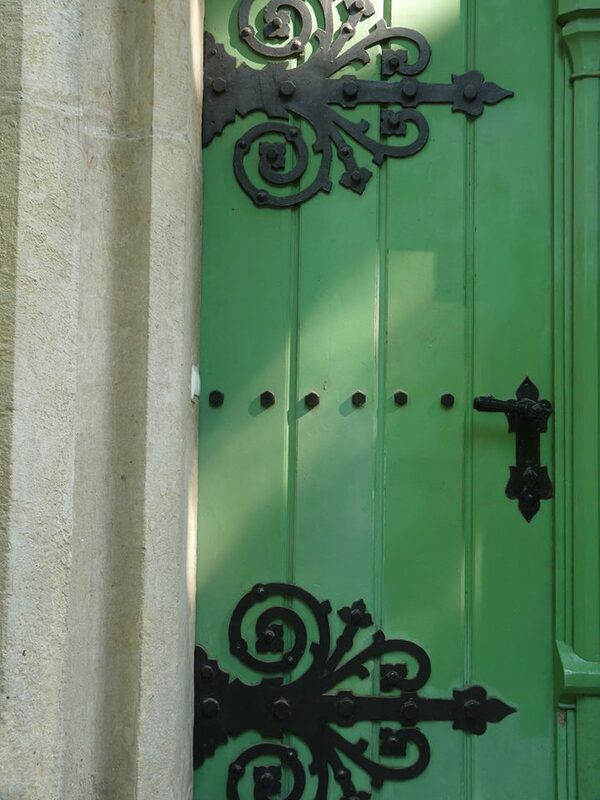 And where better to start experimenting than with my little blog baby. So I need to “engage with a virtual audience” and “write myself into existence” if the online masters are to be believed. Hence my closer attention to what I write and how I write it, plus a general neatening up of old posts. Why not treat yourself to a skip back in time to some of my earlier musings. You never know, I might amuse you too!!! 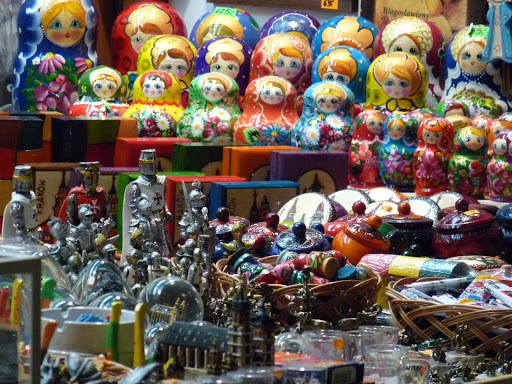 Here’s a few colourful pictures of some of the traditional handicrafts up for grabs in the Cloth Hall and other shops across Krakow. 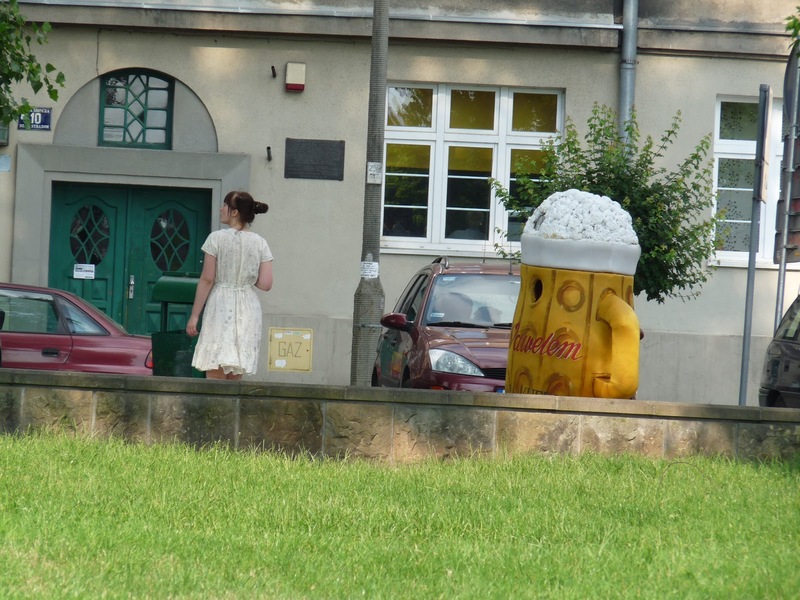 The oldest and most traditional Polish fast food is obwarzanek. 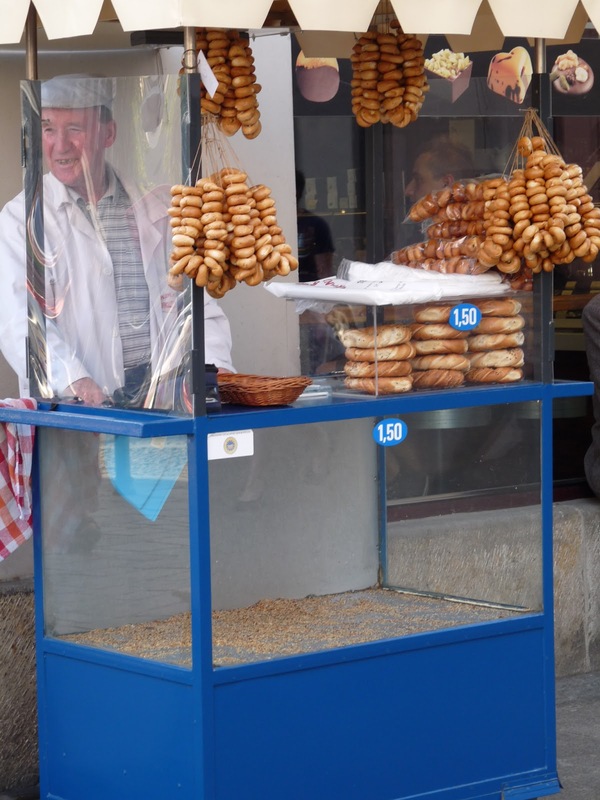 These bread rings have been baked in Krakow since the thirteenth century. 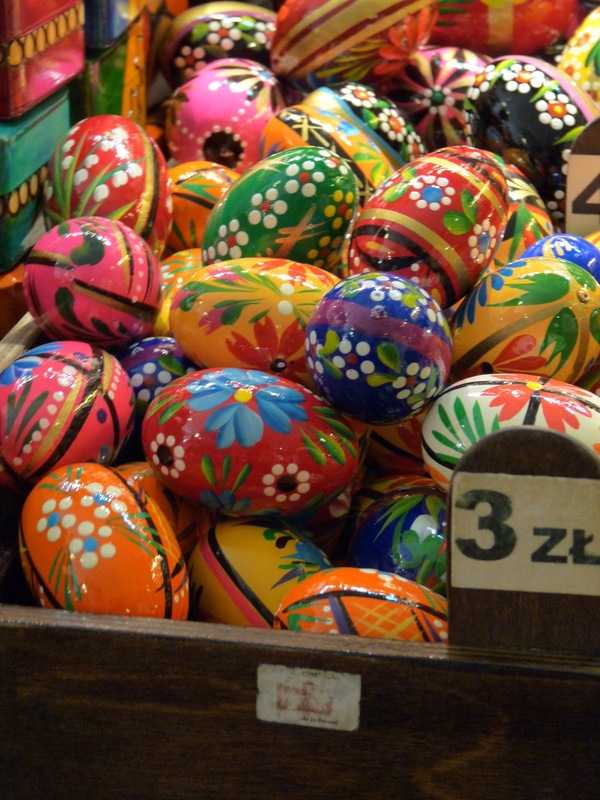 Painted eggs known as pisanki are a pretty souvenir to take home (and you can fits loads in your hand luggage!!!) 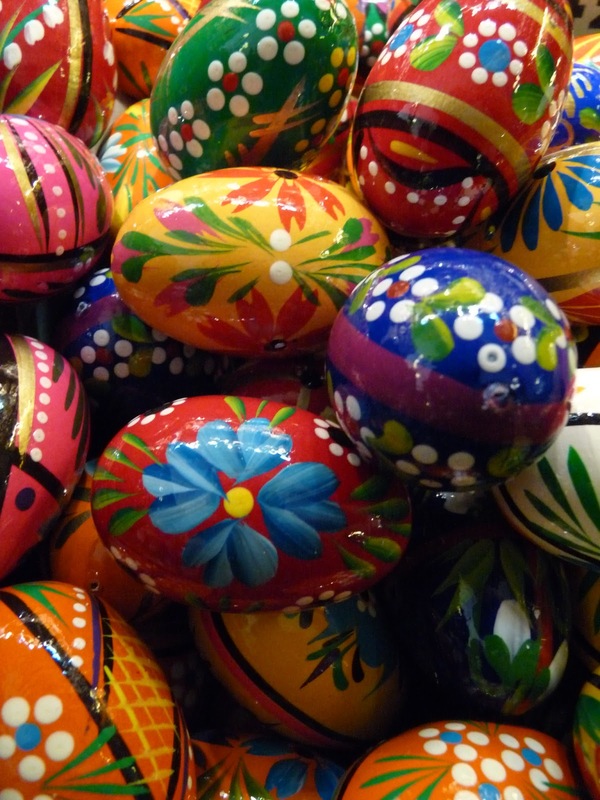 They are usually decorated for Easter and are found, painted in jewel bright colours, in every shop window. 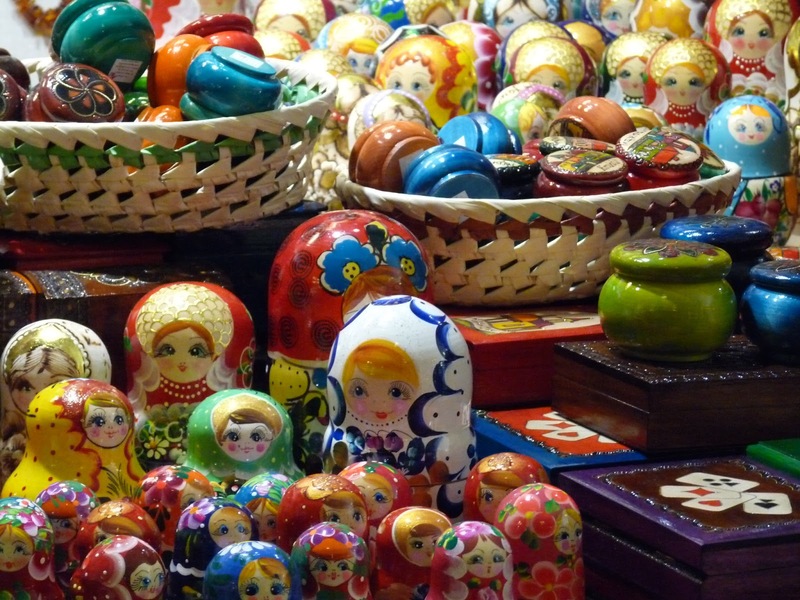 Although mainly associated in most people’s minds with Russia, nesting dolls are thought to have originated in China and can be found all over Eastern Europe in every shape, size and design. 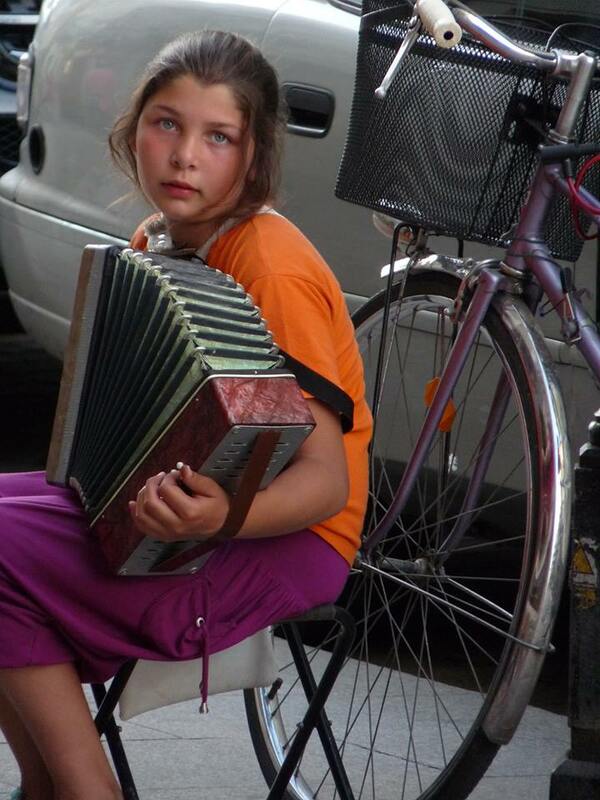 A short, photo tribute to the coolest and cutest (and most resiliant) person in Krakow. 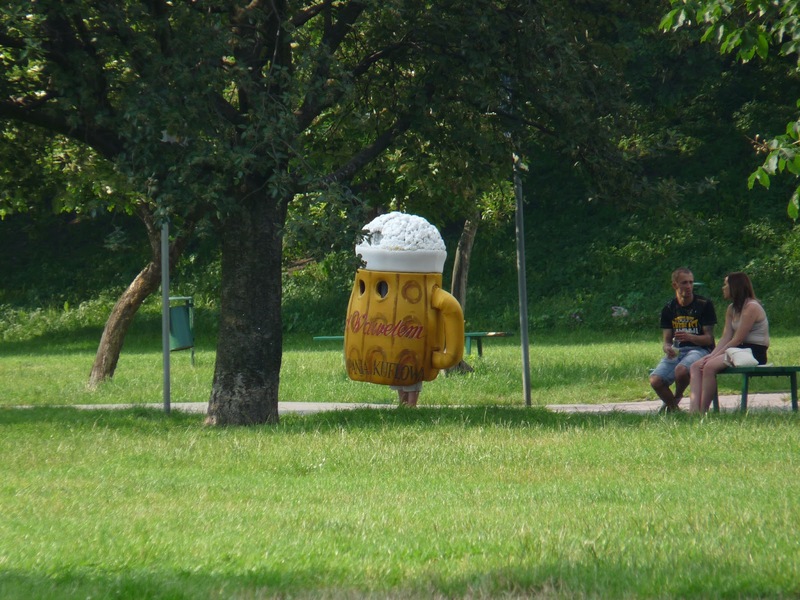 The Wawel beer man!!! 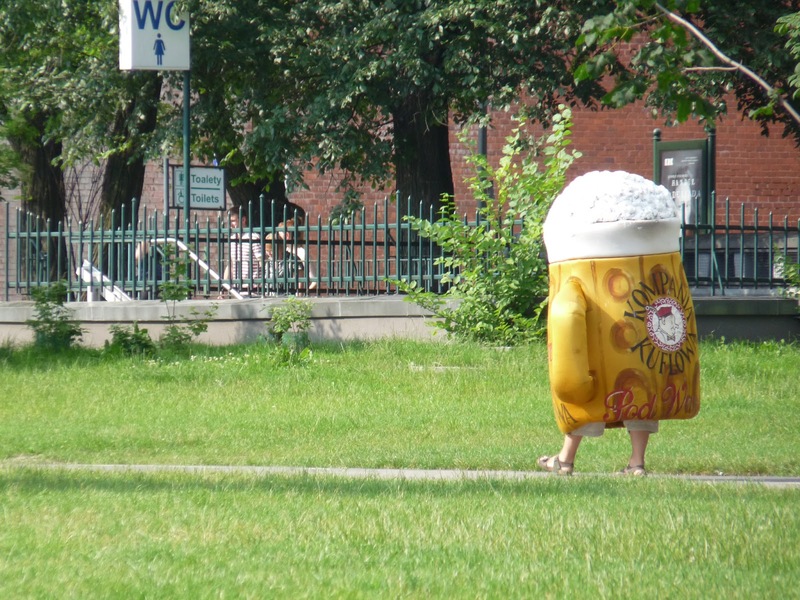 In 30 degree heat this little trouper gamefully kept on walking around the park in his heavy foam padded outfit, just occasionally drooping a little it has to be said, or stopping to pensively loiter under a shady tree. 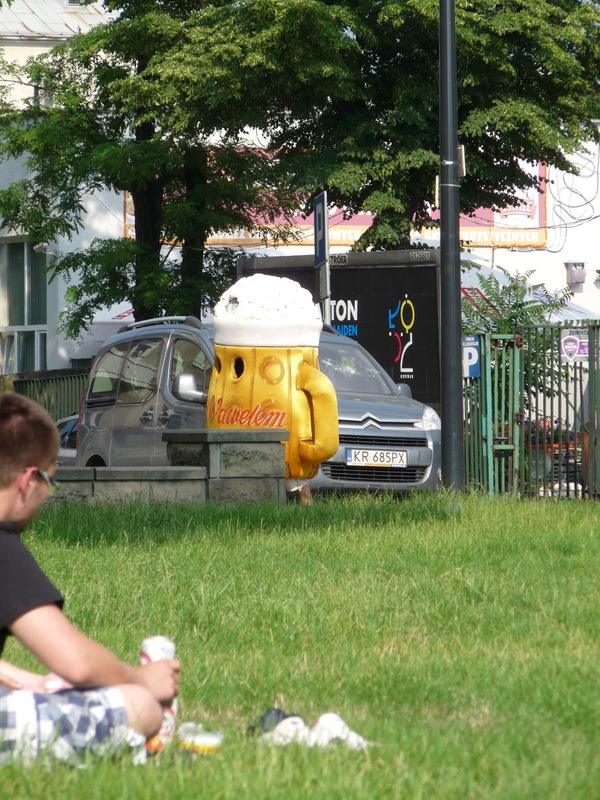 I believe occasionally he had a “free beer” placard in his grasp but it seemed to disappear from time to time. I think his little eye holes express both melancholy, hope and dogged perservance . . . .
Neil looks a trifle concerned however as he senses a hovering beverage in the background. Taking a break in the shade and studiously ignoring people. 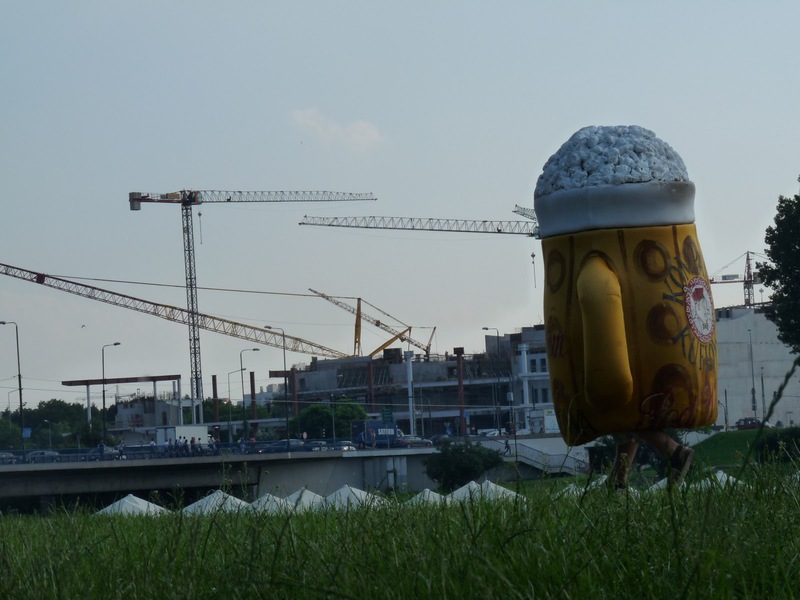 The little foam man is drooping a little in the hot hot sun and possibly heading to the ladies loo!!! Stalking a woman in a slightly sinister yet still somehow adorable manner . . . 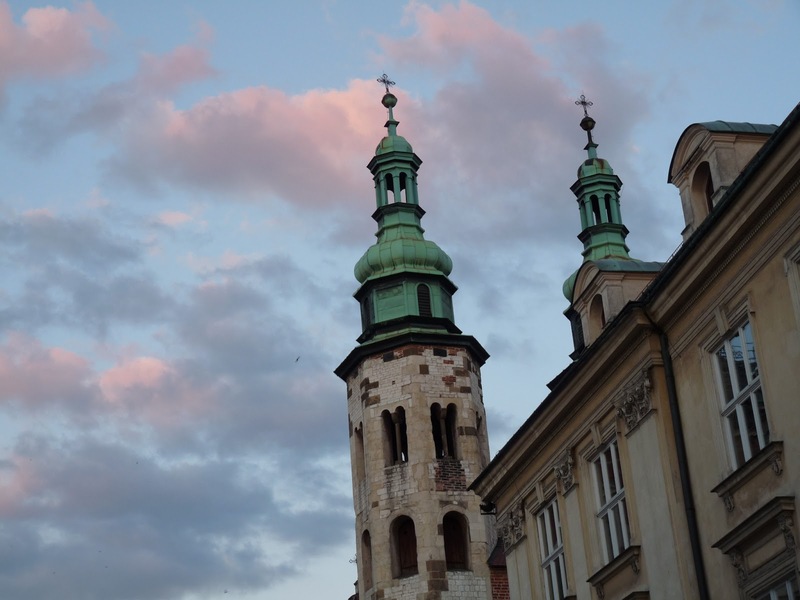 Following on from our difficult day at the concentration camps we wanted to see another side to Poland so set off on a wander around Krakow old town. 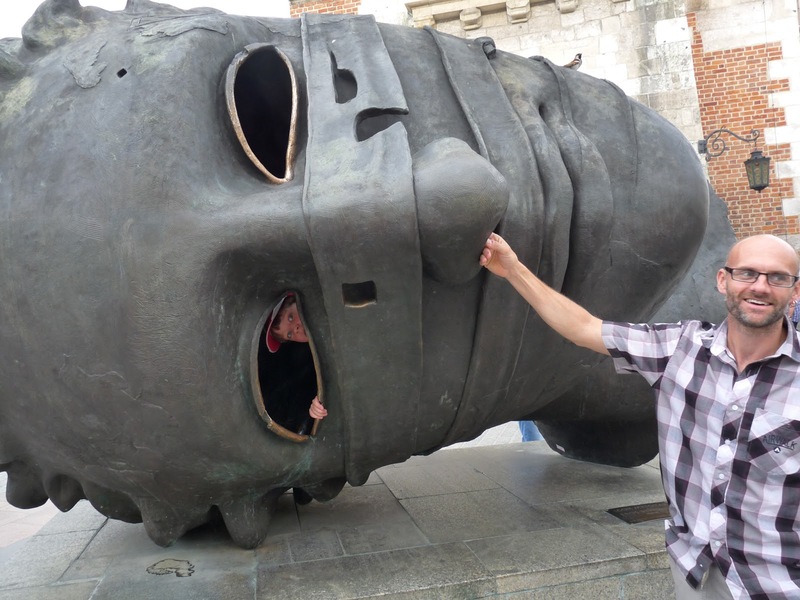 Here’s some interesting (and not so interesting) facts about Krakow and some random photos from our aimless sauntering. 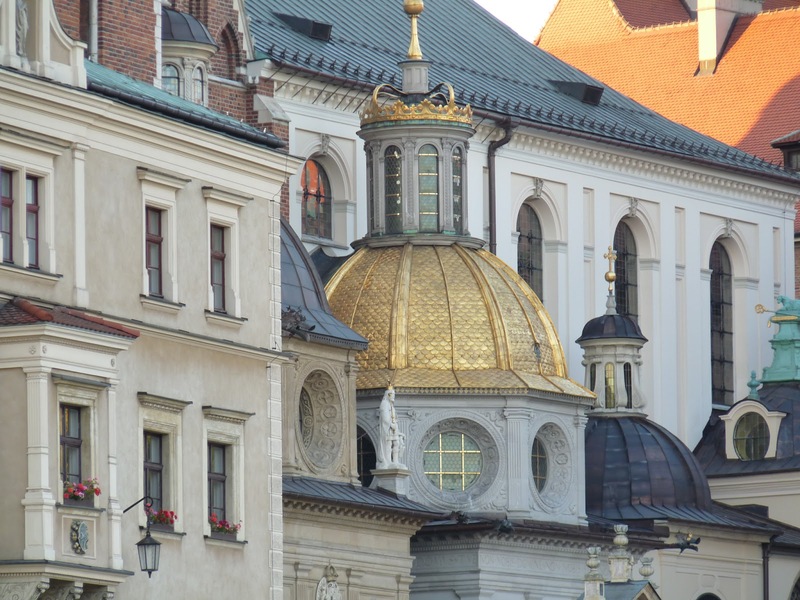 3) In 1978, UNESCO put Krakow’s historic centre on the list of World Heritage Sites. 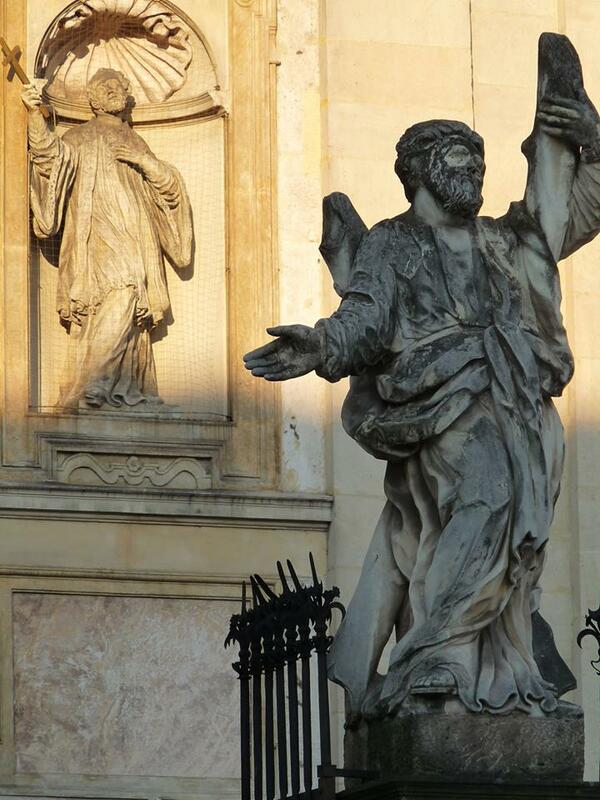 A young girl busks for change in the street as the sun hits the detailed sculptures of apostles outside the Church of Saints Peter and Paul. 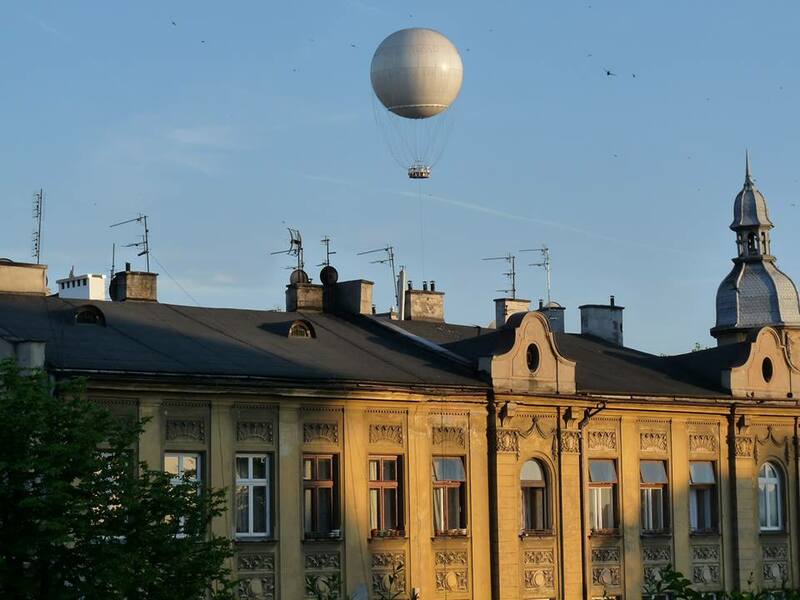 A tethered balloon rises high above the city and optical illusions and religious scenes enliven the walls of a building. 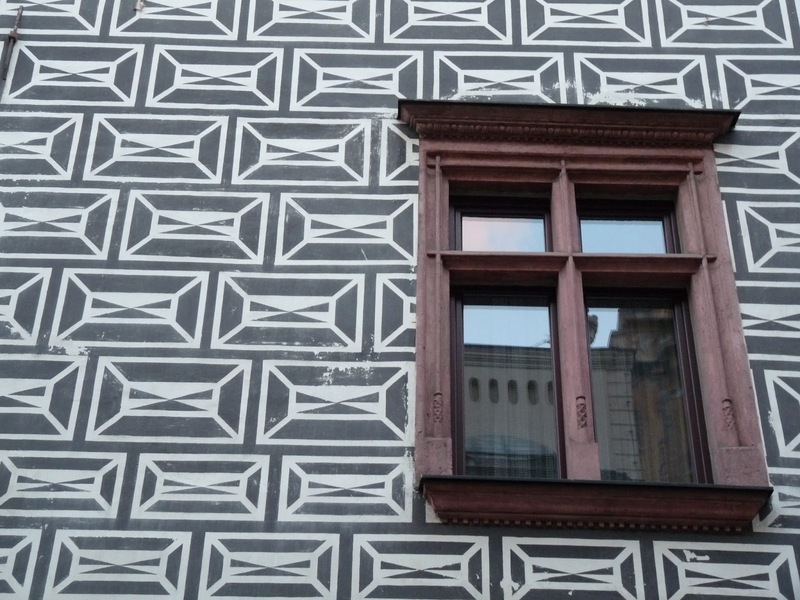 I love the details and decorations on buildings, it’s not something we particularly have in England, except for grafitti. As you walk around the camp you will see at the side of the tracks a railway carriage. 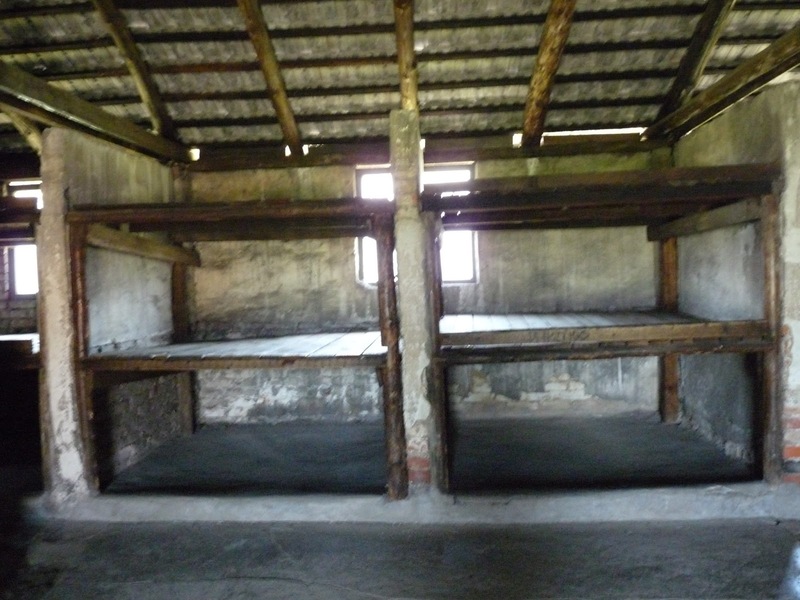 It is the same as the carriages that transported the camp inmates to Birkenau. 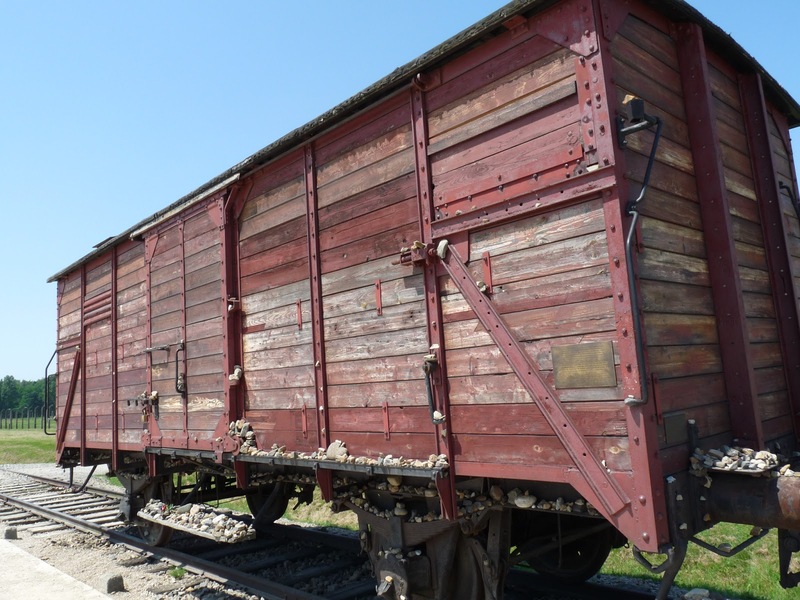 The carriage is there thanks to Frank Lowy, a Holocaust survivor and son of Hugo Lowy — a Hungarian Jew who was beaten to death by the Birkenau guards when he refused to give up his tallit and tefillin. 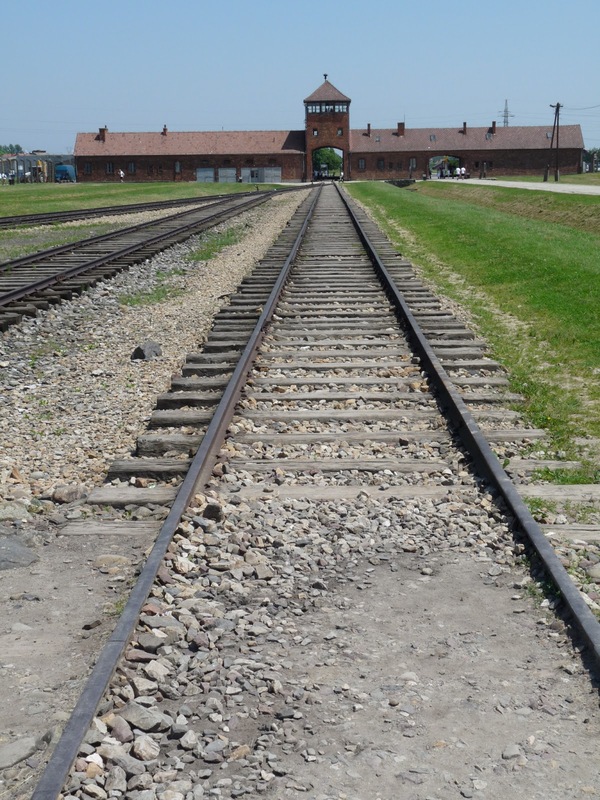 He helped to bring the restored wartime railway carriage to Birkenau in 2009 and it now serves as a memorial to the half million Hungarian Jews who died there. Wooden, with no windows and very little ventilation, the carriage tells its own sad story. Hundreds of people were crammed into each carriage, sometimes in sweltering heat, other times in the bitterest cold. People were bought into the camp from hundreds of miles away, from all corners and the farthest reaches of the Nazi empire. Little wonder that hundreds of them died during the journey. The carriage is covered in hundreds of rocks and stones. This made little sense to me at the time but I later learnt that in Jewish cemetries and on graves they do not leave flowers as they are transitory and for the living. Instead they leave stones. 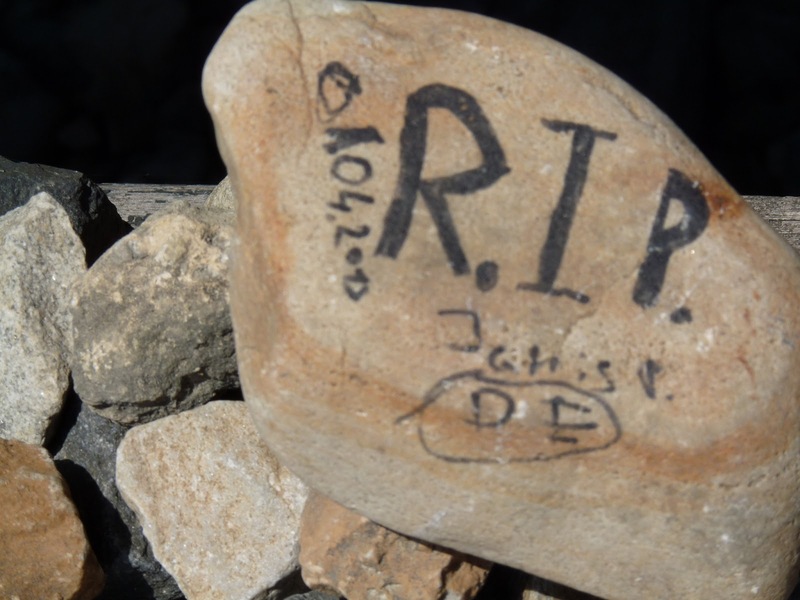 A far more lasting memorial to loved ones. 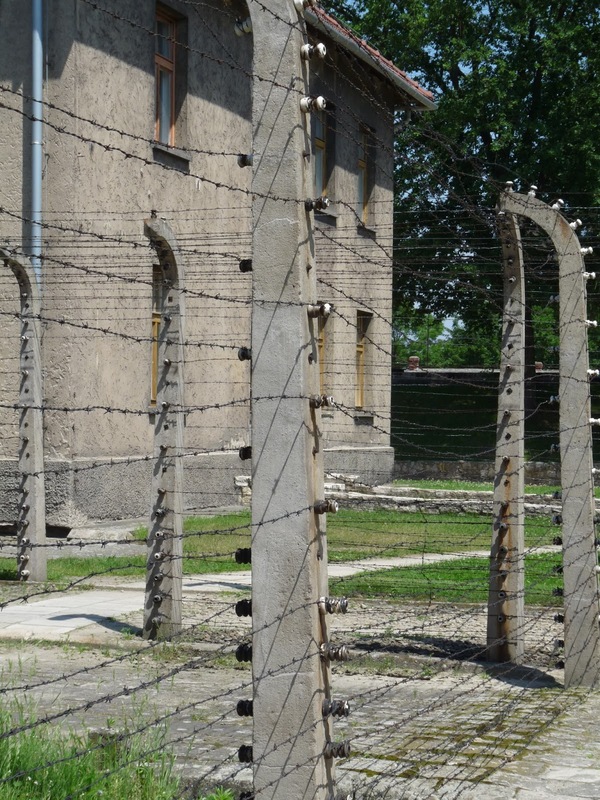 Birkenau started to be constructed in 1941. Its scale dwarfs Aushwitz 1, it is said to be around ten times bigger. 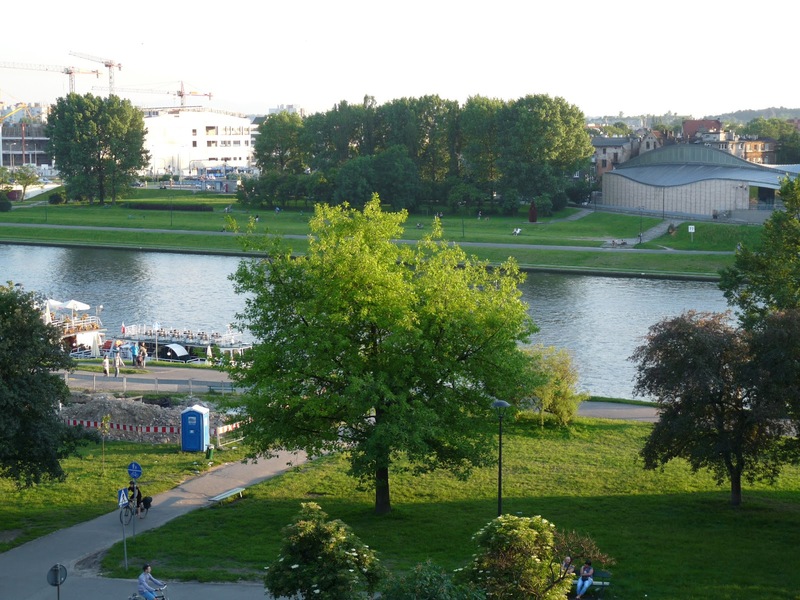 Many of the original buildings were destroyed in an uprising in 1944 and as the Nazis fled in the face of the Soviet army, but you can still see where the chimney stacks were, stood in uniform lines, on and on and on, stretching as far as the eye can see. 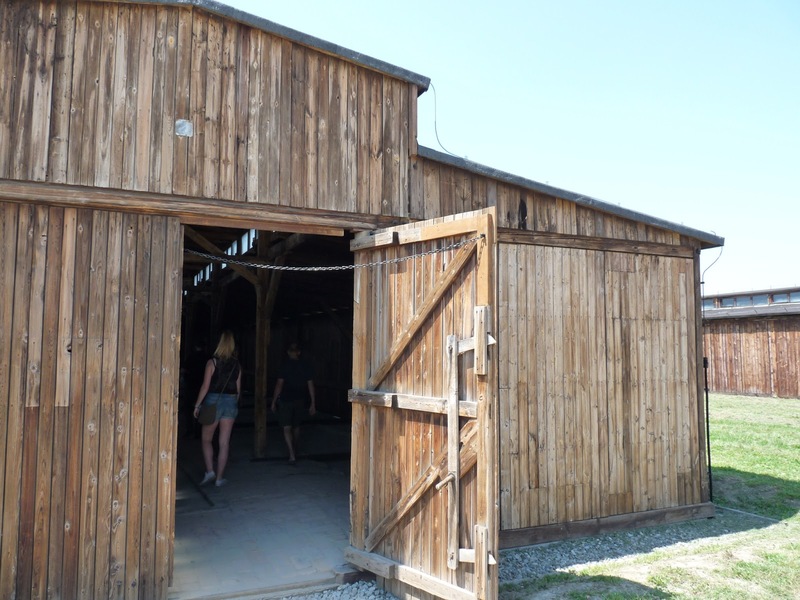 As it became too time consuming and difficult to build from scratch, and more and more people poured into the camp, the Nazis used wooden horse stables to house them. They were designed to hold upto 52 horses. Here they held hundreds of human beings. The heat inside these wooden shacks is unbearable in the middle of summer yet tortuously cold in the depths of winter. There is a small oven in each of the cavernous sheds but nothing that would offer any respite or comfort from the harsh, freezing mid winter. Hygiene was non existent and the swampy ground of the camp meant that many people contracted malaria. Water was filthy and people also had lice, scabies and serious stomach problems. 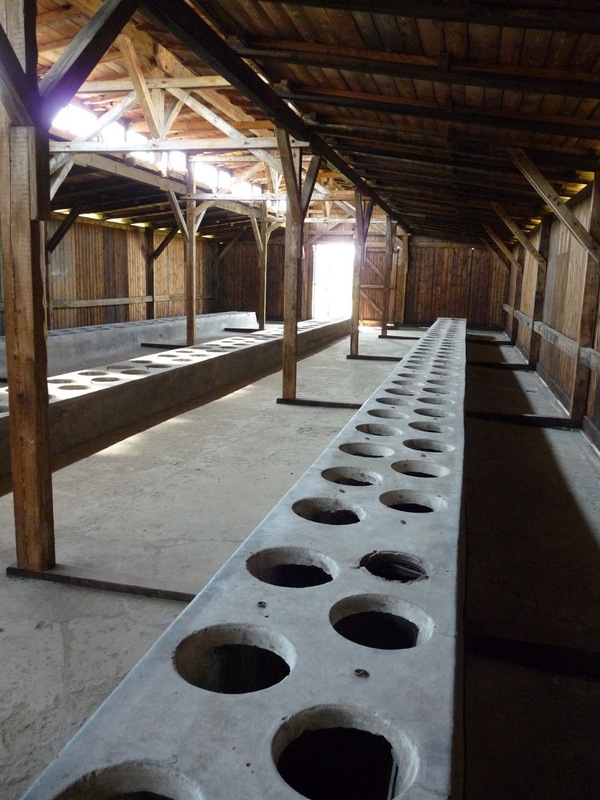 Here you can see the communal toilet, opened twice a day, where prisoners had to file in, sit, do their business and get up again in a matter of minutes. Completely against human nature, many did not even sit over a hole, they were in such a hurry they sat between them. The stench must have been unbearable. 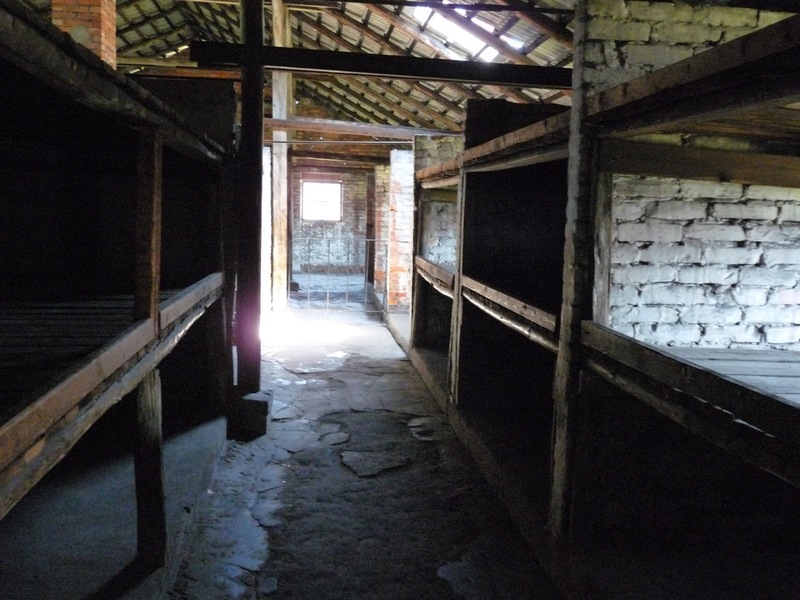 The wooden slats in the sheds that pass as sleeping accommodation would not be fit for a dog let alone a human being. The people who could least fend for themselves, the old, the ill, would have one of the lower sleeping sections. People above them, unwilling to leave the warmth, or ill themselves, would relieve themselves of any and all bodily functions where they lay. This is turn would make its way onto the people below, who were often too weak to move. It is beyond comprehension how one group of people could dehumanise and demonise another section of humanity to the extent that they could subject them to this treatment. For me the true, unabating horror was that it was not just the warped ideas of a single, homocidal maniac. Hitler could never have perpetuated his crimes had it not been for a whole command structure beneath him who were eager to carry out his diabolical orders, and even came up with their own sickening ideas. You do not ever want to believe mankind is capable of such evil, yet it happened. And it continues to happen. Human beings seem, above all, very good at hating. 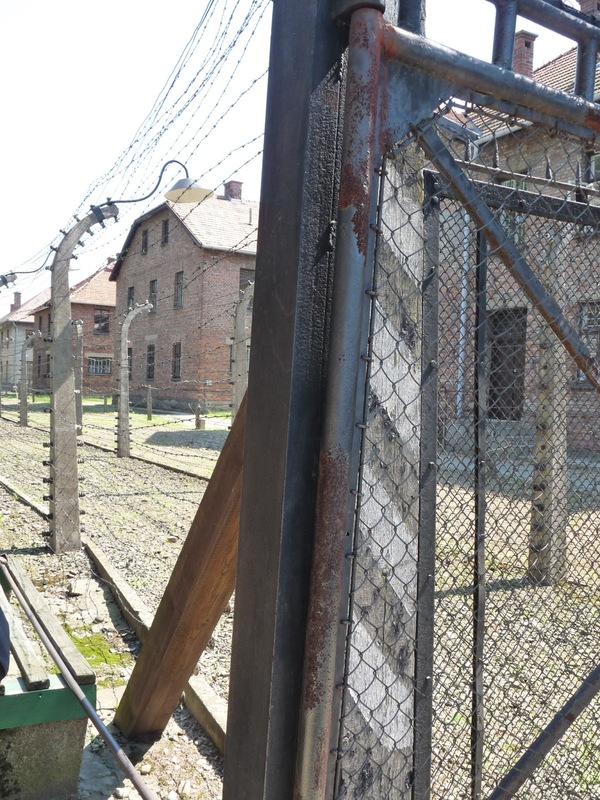 From Auschwitz 1 we took a short shuttle ride to Auschwitz 2 – Birkenau. 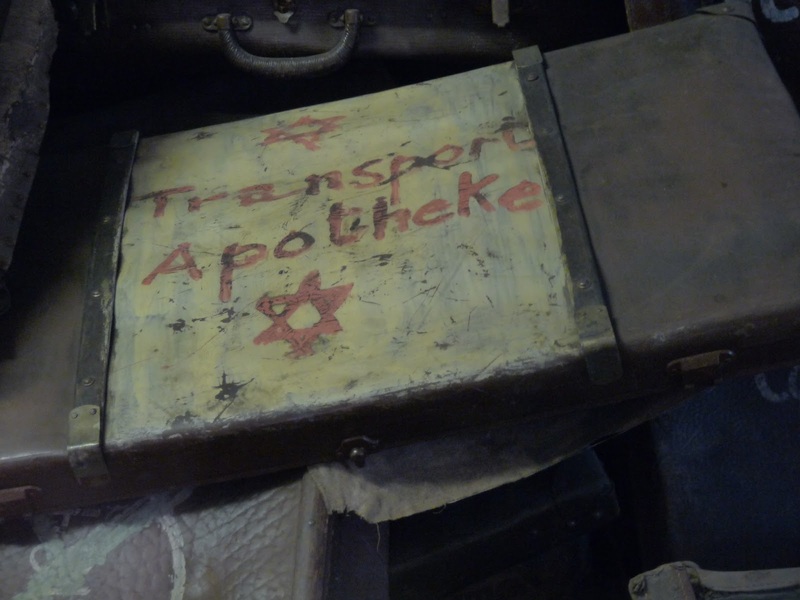 One of the largest camps in the complex, it had one main, overarching purpose – the extermination of the Jewish nation. 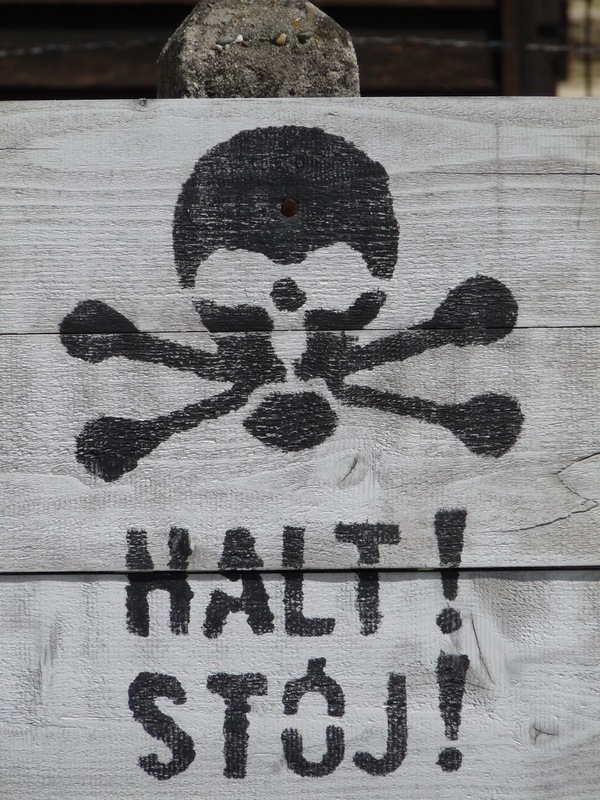 It was Hitler’s “final solution to the Jewish question in Europe.” In total it is estimated that around 1.3 million people were murdered here. The infamous camp is instantly recognisable from the moment you see the brick archway with railway tracks running directly underneath it. 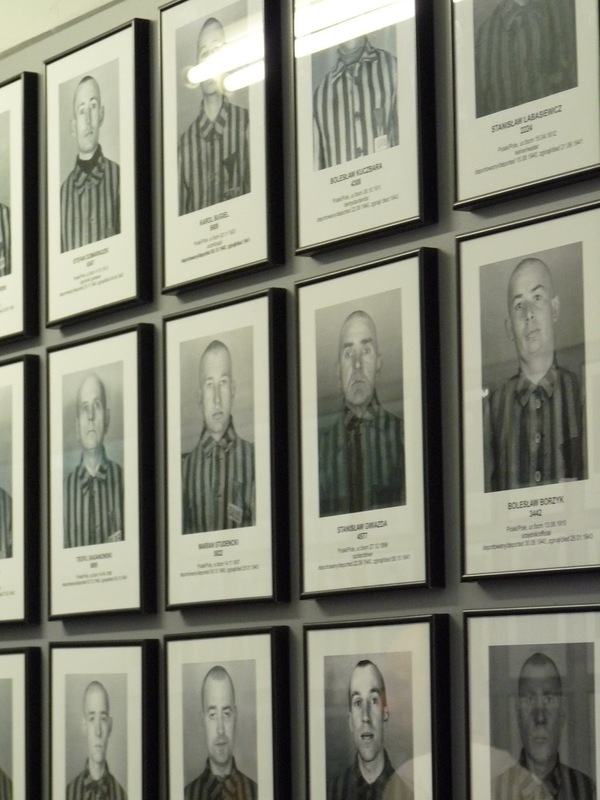 You have seen it in countless black and white photographs documenting the horror of the Nazi regime, it has featured in countless documentaries that attempt to lay bare the suffering and degradation of the inmates. By this point in the day the heat is nearly unbearable and the camp stretches out in all directions as far as the eye can see. Trying to imagine being in one of the mass transports that regularly delivered people to the site, in this heat, makes you feel sick. 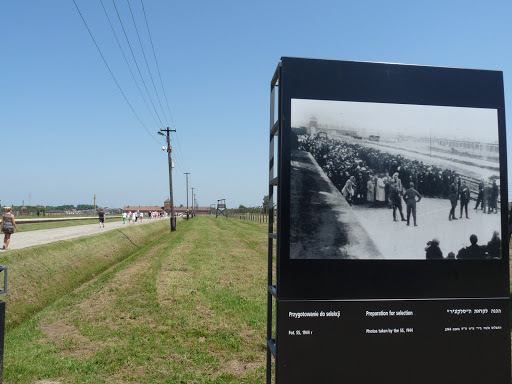 People fit enough were put to work while the others – the elderly, the infirm, the sick and the children, were sent straight from the transport waggons to be put to death in one of the huge crematoria complexes located at the far end of the camp. The photograph shows the scene as thousands of people are unloaded from a transport on this spot. 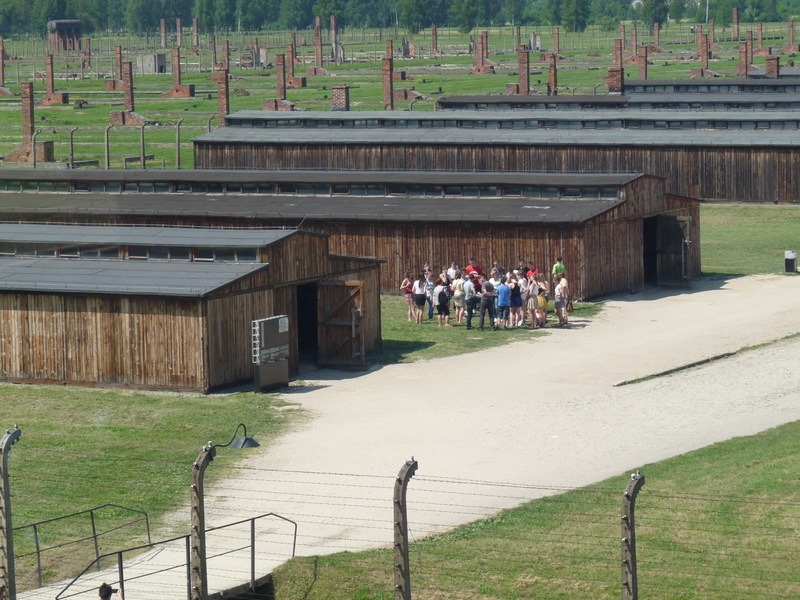 Many of these people would only make one journey in Birkenau. Straight to the back of the camp and to the gas chamber. Once inside the imposing brick buildings that seem so innocent from the outside there are several devastatingly simple displays. One room is completely empty except for a glazed section that runs from one end to the other. 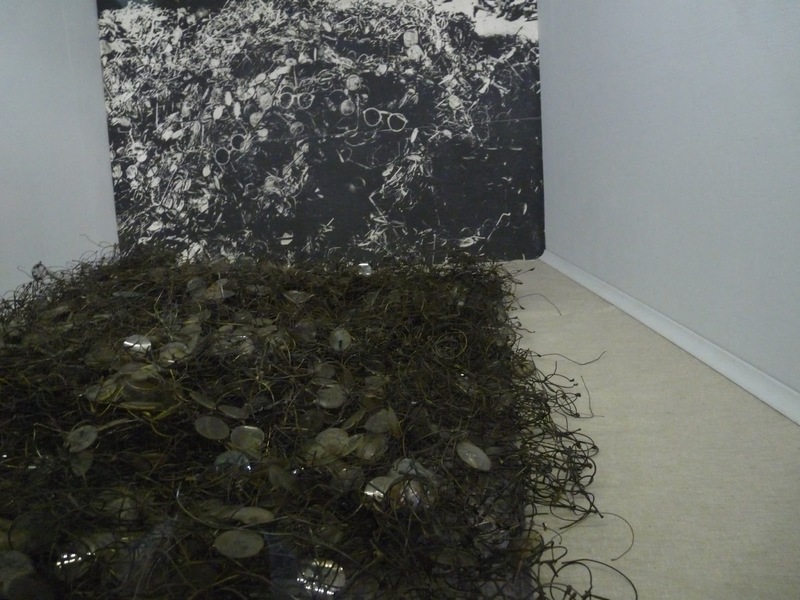 Behind the glass, from floor to ceiling, is an immense mountain of human hair. 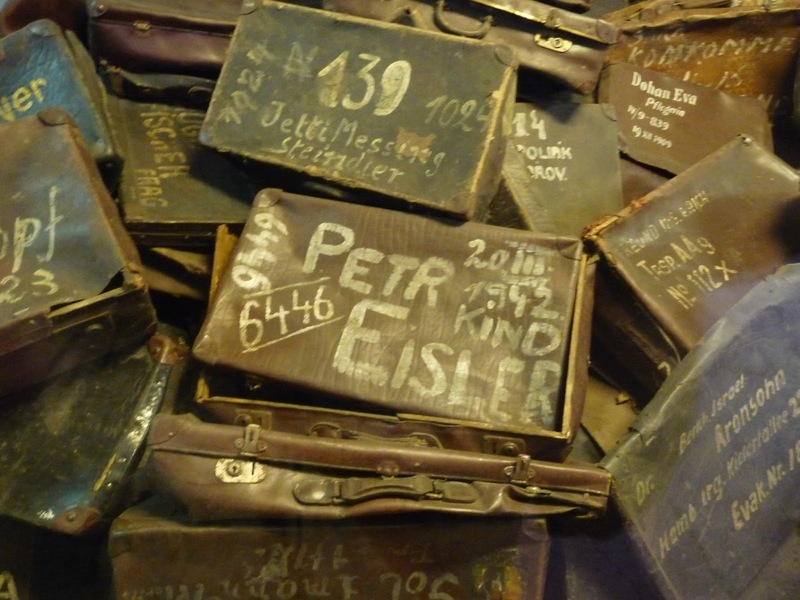 Another room houses piles upon piles of suitcases, taken from the prisoners. Many are marked with the star of David, others poignantly say “mit kinder”. 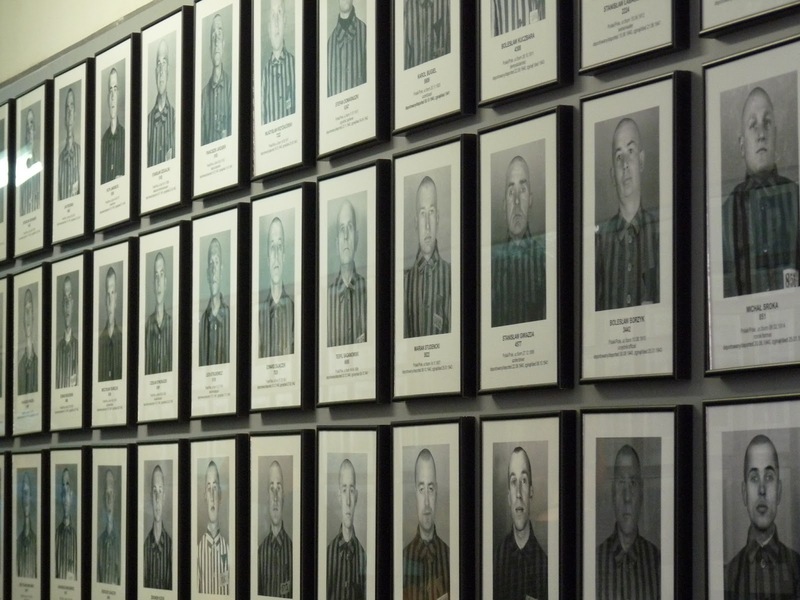 Mounds of spectacles gaze blankly out at you from another while endless shoes are a silent testimony to the thousands of people who, once incarcerated, never walked out of the death camps. 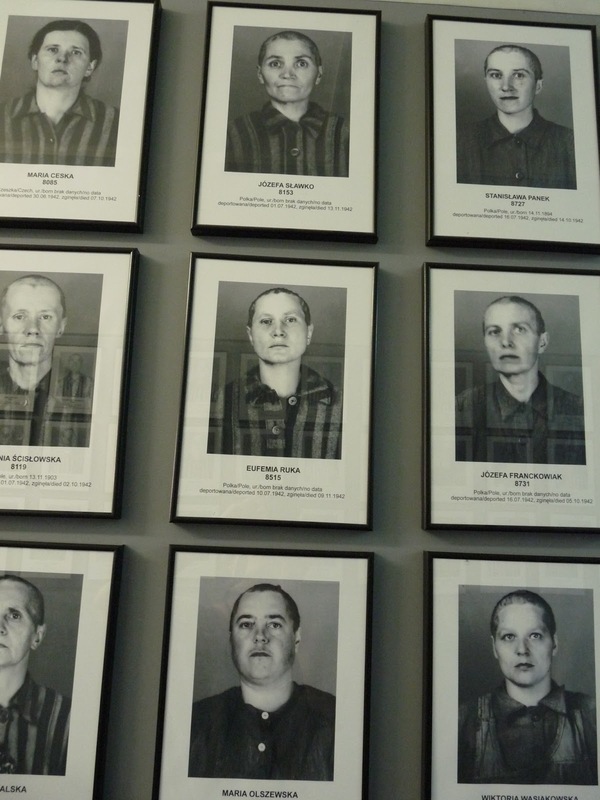 Another of the buildings contains a corridor lined with endless black and white photographs of prisoners. All in the regulation striped uniform, all with roughly shaven heads. The women seem particularly to have been callously treated, their hair, once a crowning glory now stripped to degrade and humiliate them. It is a gallery of despair, where every pair of eyes is a mute plea for mercy that never came. 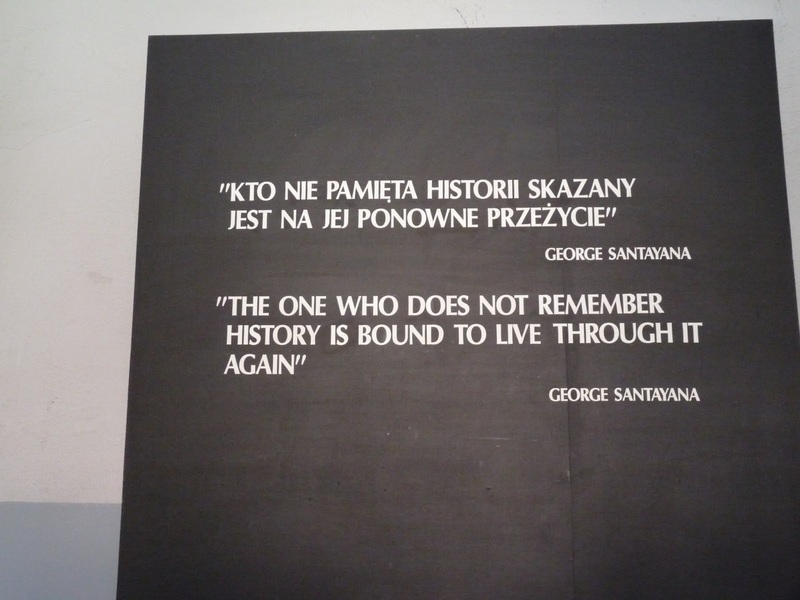 The horror of Auschwitz is not immediately tangible when you walk through the gates, it was not the instant cloying weight, the punch to the stomach that I thought it would be. 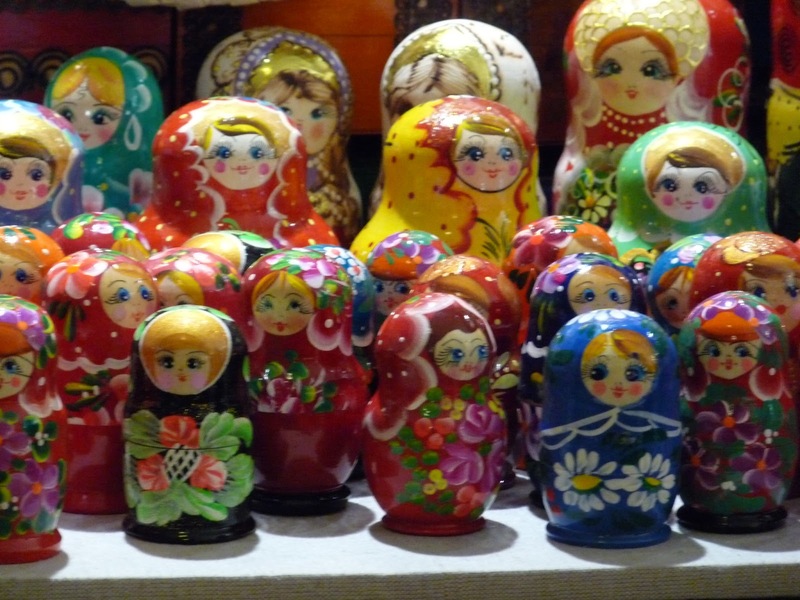 It gradually builds, with each room, each exhibit, each photograph. 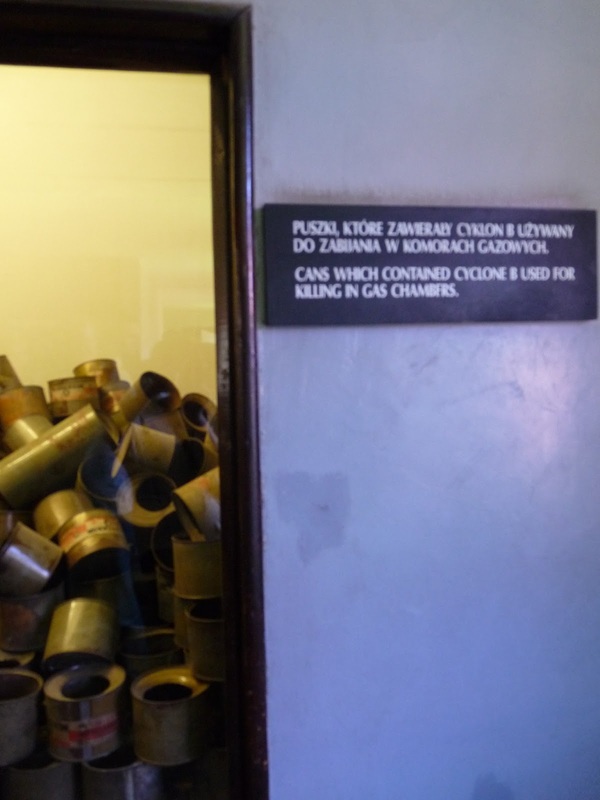 By the time you end up in the gas chamber, the ultimate symbol of evil, it feels difficult to breathe, your eyes have taken in too much but not really comprehended. It is only later that you cry.